Inexpensive, usually no more than 50p per week or free Aim for at least 20 adverts and then 5 a week. Book the adverts for no more than 4 weeks at a time, any longer the advert may fade, fall off the board, get soggy with condensation etc. 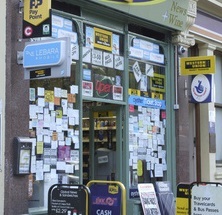 There are many places where you can place shop window adverts in addition to newsagents. Try also: Post Offices, garages, grocer shops, charity shops, take away outlets clubs and pubs etc. Most supermarkets have some form of free advertising – you may though need to use their standard post card. Next time you go to the supermarket ask for some cards so that you can prepare them in advance, to use on your next visit. If you are told “sorry no business adverts”, place it on the board on your way out – the worst that can happen is it will probably stay there for a few days – you may get a call. Some shops will even let you place an advert for free, if you don’t ask you won’t know – try charity shops, small local shops/stores that do not have an obvious notice board. If you run out of shops/newsagents/post offices etc. use www.yell.com - type in newsagents etc. and the locality. You can then access a printable list. This is really useful if going to a new area – armed with an A-Z map you can find your newsagents so much more quickly. You could also, using www.yell.com, mail shot news agents anywhere in the country. “I’ve just seen your advert in the shop window. I hope you don’t mind me calling, but I’m looking for people, possibly like yourself, who are self-motivated and business minded. I may have an opportunity that could be of interest to you. Can we get together for half an hour to talk it over”? Their response will either be no thanks or what is it? Use whatever script is currently working for you.